Potatoes are highly heterozygous and the conventional breeding of superior germplasm is challenging, but use of a combination of MAS and EBVs can accelerate genetic gain. Cultivated potatoes are highly heterozygous due to their outbreeding nature, and suffer acute inbreeding depression. Modern potato cultivars also exhibit tetrasomic inheritance. Due to this genetic heterogeneity, the large number of target traits and the specific requirements of commercial cultivars, potato breeding is challenging. A conventional breeding strategy applies phenotypic recurrent selection over a number of generations, a process which can take over 10 years. Recently, major advances in genetics and molecular biology have provided breeders with molecular tools to accelerate gains for some traits. Marker-assisted selection (MAS) can be effectively used for the identification of major genes and quantitative trait loci that exhibit large effects. There are also a number of complex traits of interest, such as yield, that are influenced by a large number of genes of individual small effect where MAS will be difficult to deploy. 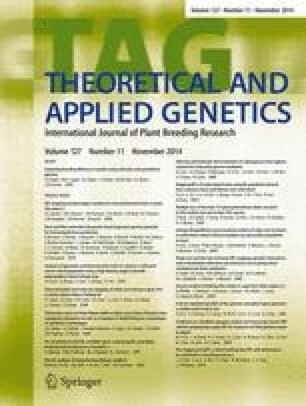 Progeny testing and the use of pedigree in the analysis can provide effective identification of the superior genetic factors that underpin these complex traits. Recently, it has been shown that estimated breeding values (EBVs) can be developed for complex potato traits. Using a combination of MAS and EBVs for simple and complex traits can lead to a significant reduction in the length of the breeding cycle for the identification of superior germplasm. This work was supported by funding from Horticulture Australia Limited and the Victorian Department of Environment and Primary Industries. All experiments comply with the current laws of Australia and Scotland.